This is quite an extensive book containing over 300 pages, which contain many photographs and drawings. 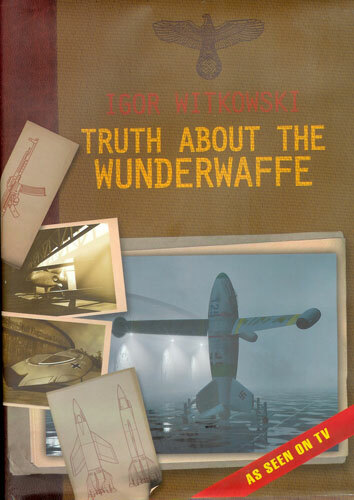 The first few pages contain some in depth detail on the vengeance weapons such as the V1, V2 and V3 and some interesting detail on the Rheinbote. The V3 is covered with some good details and photographs of the actual weapon. It consisted of a barrel 130 metres in length, with staged charges that would send the projectile approximately 160 Km. This section also contains some original photographs of the A-4b winged and manned versions of the V1. On the Luftwaffe side of projects there is plenty of detail provided of the Me 262, 163, and P1101, the He 162, Ho-229, Fw Ta-183, and the helicopter development. Plenty of sketches and line drawings of lots of ‘pie in the sky’ projects but strangely this resemble many aircrafts produced by the USA and USSR trough the 1950s and 60s. The Germans also spent a lot of research time on Electromagnetic weapons and many copies of the original documents are included in this section. These make for some very interesting reading in particular the electromagnetic canon. The late war tanks are covered through the research and development phases, these include such tanks as the Tiger I and II, Panther, Tiger Ferdinand and the huge Maus. A photograph and detail is included of the Raumer S which looks like something out of Aliens with very large wheels. Something that I learned through this section was the German development into Gas turbine engines to propel their tanks. Other weapons covered are the sound cannon for generating shock waves, stealth coverings for submarine snorkels and the type XX1 submarine. Quite a large section is dedicated to nuclear weapons and their development but the most interesting section was of the underground mittlewerk and the original plans and photographs. I would highly recommend this book to any person who is interested in the late war research and development of the German Weapons, it gives some insight into where some of our current weapon technology comes from.